A night cough or tussis will mostly occur at night, usually when lying down, which is known as postural cough. A cough is when we rapidly expel air from the lungs and this reflexively occurs in order to maintain clear airways. Night coughs may indicate conditions that specifically affect the throat and lungs or may be part of a more general condition, like the flu or a cold. Sometimes night cough will be accompanied by other symptoms and that depends on the underlying condition, disorder, or disease. Most of the time, symptoms affecting the respiratory tract will typically involve other parts of the body, including belching, wheezing, nasal congestion, stuffy nose, sore throat, fever or fatigue. Coughing at night can be caused by many different conditions and illnesses. Some of these, such as allergies and the cold, more commonly lead to coughing at night than others. Allergic reactions. Night coughs may be due to allergies, such as to foods, pollen, cosmetics, animal dander, dust mites, or dust. Asthma may also lead to a nighttime cough and this may or may not be due to an allergy. Dry air. Dry air will aggravate an irritated throat or nose, worsening a nighttime cough. Common cold, flu. 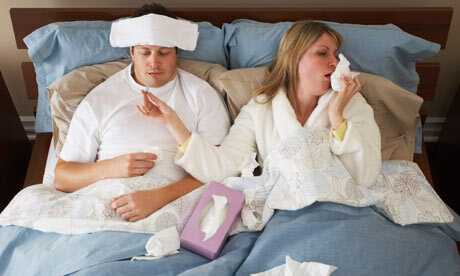 The common cold and flu are both frequently accompanied by coughing at any time of the day, including the night. Acid reflux disease. GERD may also cause coughing. In this case when you lie down the stomach acid (that leads to heartburn and indigestion) may wash into your lungs. Severe sinus or airway congestion. These can worsen your coughing at night. When you lie down, phlegm doesn’t drain easily and mucus may accumulate in your throat, both of which lead to a nighttime cough. Gravity. When you lie down, your gastroesophageal reflex will kick in as mucus starts automatically pooling. The ideal way to counter this is by elevating your body. Iron deficiency. If you have low levels of iron, you may notice irritation and swelling towards the back of the throat and this can cause coughing. The solution in this case is simply taking an iron supplement. Infections. Cough can also be due to infections that inflame the sinuses, throat, or lungs. These include tuberculosis, pneumonia, pleurisy, croup, chronic obstructive pulmonary disease, and acute bronchitis. Certain kinds of medicines. Certain medications for high blood pressure or heart failure can lead to nighttime cough. ACE inhibitors, for example, frequently lead to a cough that is most active during nighttime. If the cough interferes with your sleep, you can try other antihypertensives. The treatment for coughing at night depends on the cause, so you must first find out the reason you cough. The following treatments can help to soothe a ticklish throat or over-sensitive airways, thereby relieving your cough at night. Hot tea has been used to relieve coughs for years. Green tea, for example, is rich in antioxidants, helping to reduce the symptoms of upper respiratory infections. You can also add honey. But for children under 1 year old, honey may cause infant botulism. When using a humidifier or vaporizer, you will add moisture into the air, moistening your airways and reducing your chances of nighttime cough. Be sure not to add too much moisture as this will increase the cough. Keeping humidity between 40% and 50% will prevent common allergens from thriving. It can also be helpful to simply sit in a room with steam. However, if you have asthma, steam may worsen the cough. As mentioned earlier, when you lie down, the mucus pools, irritating your throat. To solve this issue, prop yourself up with pillows while sleeping. If you have acid reflux, lift the top of your bed by about 4 inches with a wooden block to prevent throat irritation. When you are getting ready for bed, try to keep items such as water and cough drops handy. Stopping the cough right away should help you get back to sleep, preventing the cough from returning. Remember that coughing dries and irritates your throat, leading to more coughing. Mold and dust are common allergens, so be sure to keep your room free from dust to get good sleep. Frequently dust and vacuum your bedroom and wash your bedding using hot water weekly. Wrap your pillows and mattress in plastic so dust mites can’t invade. Taking a cough suppressant before bed can reduce your cough reflex. Be sure to select a medication designed for dry coughing at night and ask your doctor if necessary.